Contreras Railway Viaduct is one of the main structures on the Madrid – Valencia high-speed railway link. 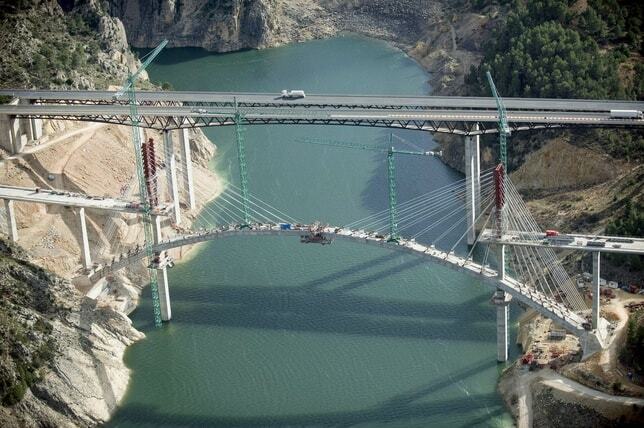 Upon completion, the structure became Spain’s largest concrete arch for a rail bridge. Villargordo del Cabriel stretch represents an example of the use of the state-of-the-art construction systems, instigated by the limitations resulting from a layout that allows the running speed of up to 350 km/h, with large radii bends and gradients of less than 30‰ in area with rugged terrain conditions. It is against this background that the arch bridge over the reservoir stands. This is a reinforced concrete arch bridge with a 261 m span and an upper pre-stressed concrete deck that on the construction completion date was world record holder for a concrete railway arch bridge. The bridge amounts to a total length of 587.25 m. The arch span measures 261 m and the midspan sag is 36.944 m, which determines a span-to-rise ratio of 1/6.77. The arch is embedded in two large plinths that allow the diffusion of the load over the affected ground by means of direct foundations. Tallest pier is 67m high. The cross section is a box girder with a variable depth ranging from 2.80 m at mid-span to 3.40 m at the ends. The box girder width is also variable ranging from 6.00 m in the centre of the arch to 12.00 m at the foundations, which is the width required to resist the great bending moments of the vertical axis produced by the plan curvature of the arch and the crosswind. 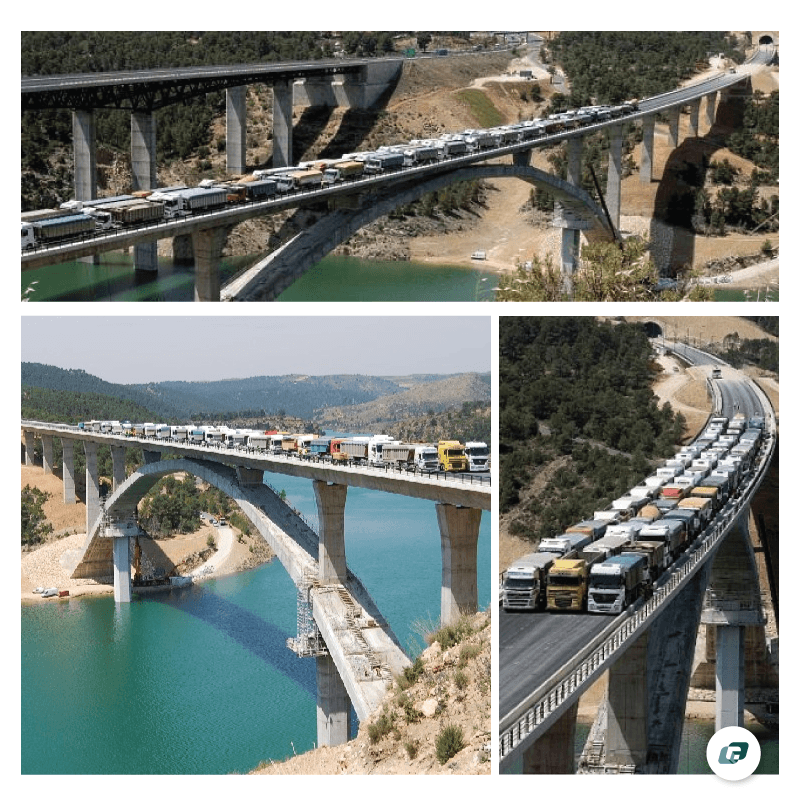 The box girder walls range from 0.60 to 1.35 m. The upper deck span distribution is 32.625+12×43.50+32.625 m.
The piers P-6 to P-11 are supported on the lower arch structure. The deck is made of a 3.00 m deep box girder (which determines a 1/14.50 span-to-rise ratio), a 5.00 m wide lower slab, a 6.50 m wide upper one, and series of segments that complete the total section width of 14.20 m. The web thickness is 0.50 m. The webs are thickened over the piers until reaching a total thickness of 1.27 m, to allow the anchoring of the service prestressing cables. The lower slab is 0.30 m thick. The arch was built by the incremental cantilever method and temporarily supported by stay cables that were anchored onto an auxiliary pylon structure built on the temporary and permanent piers.